If you can take a displaced Beagle into your home and heart, give of yourself and your time and provide a bridge to the future - you can make all the difference in the world to one dog. Foster homes are the life blood of most rescue organizations and some shelters as well. Each individual dog that is found as a stray, given up by an owner or pulled from a shelter and brought into foster care creates an opportunity for a new life for that dog. In the case of a shelter dog, it literally helps save lives. Without an open foster home, rescue organizations lack the resources to pull dogs and have a temporary place where they can be socialized and evaluated. What are the characteristics of a good foster home? - Versatility: There are times when a foster dog will need to be seen by a vet, for both routine care (spaying/neutering and updating vaccinations) and follow-up treatment (checking injuries, flea treatment, etc.). These dogs also need to be seen to be adopted, so showing the dog at public events (adoption days, pet expos, etc.) can give a potential adopter a great opportunity to interact with the dog. - Flexibility: Temporarily taking in a dog can be inconvenient and trying. You need to be able to reschedule family appointments and juggle personal priorities. Your personal pets (with your encouragement) will also need to be flexible enough to learn to peacefully coexist with the new arrival. - Patience: Not every dog that comes into rescue is affable and friendly at first. Some are quite fearful and unhappy after being in a shelter or out wandering the streets. It can take time for them to recover and acclimate to being in a home. And, a foster setting gives each dog time to come out of her shell and show her true personality. - Determination: There are going to be times when nothing seems to work, no matter how hard you try. Dealing with medications or feeding schedules, behavioral issues, or cleaning up indoor accidents isn't fun, but it is part of the routine. - Commitment: It takes very special, very dedicated people to take in a dog, teach her manners and socializes her, and then to let her go when the right adopter comes along. Although it is a bittersweet event for even the most experienced foster families, permanent adoption of the dog to the right family is always the ultimate goal. Many foster homes keep a photo album of those dogs they have helped and keep in touch with the adopters. And, yes, there are often occurrences of "foster failures"- those foster dogs that just wrap themselves around the hearts of their foster families and fit in so well that they never actually leave. Fostering isn't for everyone. Yet, for those with the uncanny ability to juggle their time, share their love, and maintain some kind of order, they are giving a priceless gift. 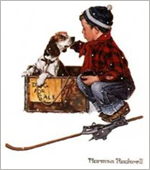 This article is reprinted with permission of the author, Caron Sarver, webmaster of Beagles On The Web (www.beagles-on-the-web.com), a Beagle breed educational and rescue resource.